I’m currently a project manager at our local electric company, and before that was a bodyman/trailer mechanic/ and worked on the trucks at core trans LLC for 11 years. 4 years prior military service also. Yea I hoped back on there to confirm it, it was Keller trucking that has the 6month contract. I’ll ask this week and make 100% sure it’s not a 2 year contract now. I wonder if they give you a choice of paying more to shorten the the 2 years? I second what Steve says. Company paid training is the route I would take. There are several company cdl sponsorship programs out there that will pay for your schooling or put you through there cdl schooling as long as you sign a contract to drive with them for a period of time. Some of these programs pay for your lodging while your there or have their own accommodations, feed you and pay for transportation there. Some even pay while you train to get your cdl and others pay once you’ve gotten your cdl. Look on the this website under cdl sponsorship programs they have bunches of company’s on there and details about each individual company paid sponsorship. I graduated ASUN CDL school 2 weeks ago. They really do the "contract"....they take the cost of the CDL school and divide that by 12. Each month you are there 1/12th is paid back. So if you leave at 6 months you owe them half the cost of the school. That is how it is for me at least. If they have changed that I do not know any details on that. Yes seems like I read that somewhere thanks for the info man, and hope all is well with you! I just read on Jeramys diary someone said that it’s a 2 yr contract now the recruiter told them that. I was under the impression that is was a 6month contract. What did they tell you? Thanks everyone! MightyQuinn I was told the same thing about the waiting period. Good luck! Hope to see you in the barn in a couple months!! Look on the training diary Jeramy H is there going through school now. He might be out with his trainer by now. I put my app in for maverick yesterday they say there’s a 1-2 month waiting period unless you get called earlier for fill-ins. Mighty Quinn- If you want it bad enough you take the Bull by the horns and do it! Best of luck. I’m getting prepared to go to Mavericks sponsorship program first step I’m taking is checking my blood pressure daily, and was a little worried that it could be high cause I’m 42 and smoke since I was15. Anyways first day test was 124/70 and today is 119/69 so I’m good to go. Next ordering birth certificate grr! Your doing awesome keep it up man! Thanks. I did look into Roehl and a few others and I read reviews about them but every company has it's pros and cons and I do know I have to stay with them for at least a year. I do like the fact that Roehl pays u from day one. Maverick does also and it’s only a 6 month contract. Not at all. They are always glad to have good drivers come on board. They don't care where you started. Remember everything about this career is measured by your performance. If you're doing a great job, any trucking company will be glad to sign you up. There's not a company out here who cares how or where you started. I started my career at Western Express. Knight Transportation was thrilled to have me come on board when I was ready. I still get calls from the people at Western Express trying to lure me back. Your record will speak for itself out here, and each of these companies are quite accustomed to drivers moving around from company to company. Ok thank you very much and your more help then ya know! Thanks for the reply oldshool. So if I went with maverick, but applied to both would prime hold it against me in the future if I wanted to switch to them for any reason after my contract? Apply to Maverick now, get on that list and start squirreling away your money. In the end if you decide on Prime it's no big deal. Trust me, Maverick will have a waiting list going with some lucky person willing to take your spot if you cancel. You're not under any obligation once you're on that list. We've had other members who got bumped up on Mavericks list because somebody canceled. It happens all the time. It's better to be waiting on the list now, than having to wait once you are sure you're ready. I plan on going to cdl sponsorship in two months with probably maverick or maybe prime still kinda on the fence guess I’ll have to flip a quarter lol. maverick there is a 1 1/2 month waiting list which is good because I’d like to save money for a couple months for bills while I’m gone. Question is how soon should I apply because I’m definitely doing this. Thanks for the info man, and good luck on your test. Maverick sponsors us through Arkansas State University Newport campus. They have a house here that you stay in for free, breakfast and lunch provided during the week. It is a 4 week program. I start week 4 tomorrow, I am testing for my CDL tomorrow. The school has been good, thet teach the permit stuff, have a range to practice the backing maneuvers, and have road instructors to take you out on the road after you get your permit on Thursday that first week. After school I will go back to the Maverick campus for a week of securement training since I am going flatbed. Then a paid week at home to transfer my CDL to my home state. Then 21 days out with a trainer, minimum 21 days, but that training can be longer if you or the trainer feel you need additional training. Then I get my truck. They gave us a 50 dollar prepaid card in orientation (week before CDL school) then a 520 dollar prepaid card for CDL school. Pay after school is 600 a week until you get your truck as long as you are available to work. All has been good so far for me. 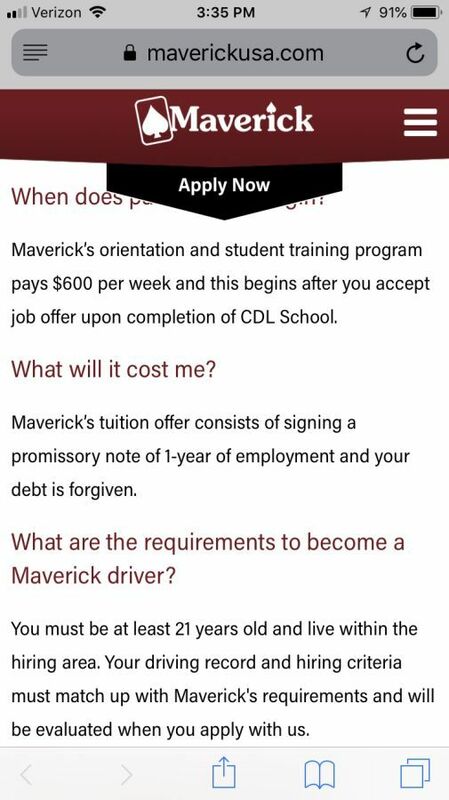 I had my cdl before I joined maverick so I'm not too sure on the details. 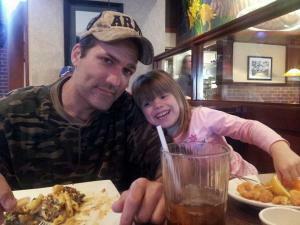 I believe that you will go to a local college and get your cdl there, which maverick sponsors. You'll be asked to stay for a certain period of time no matter which company you go with. Both companies pay quite well and have good equipment. I went with maverick because of the home time. You say you live in KY, depending on where you live you could have really good home time. The closer to Cincinnati or Louisville the better. You will see more of the country with prime and get more miles for otr. If you do regional with maverick you'll likely stay east of I 35. I am currtntly in CDL school with Maverick. I did attend a week of orientation before school. That is all that I have experienced so far. If you have any questions just ask, I will answer with the limited knowledge I have so far. I have a training diary going in the diary area of these forums. Might give some perspective of the process so far. Both companies were on my short list as well. Both are awesome companies. For me it was the hometime that had me choose Maverick. I live about 30 miles south of Kansas City, Mavericks midwest regional was available to me which is a home most weekends account. Tough choice for sure, both treat Veterans well (I am a Vet as well). Just find what works for you. Thanks Jeremy I will definitely follow your training diary. I’m in Kentucky and within there Midwest hiring area. From what I’ve seen on here you are correct when it comes to hometime. I like the way they have training set-up for prime, like going out a couple weeks with a trainer before to test for your cdl. My question is, is how does maverick do it? I've been teaching new rookies for years now that these companies have nothing to prove to you. The burden of proof is always on the driver, or on the rookie who is wanting to become a professional driver. These really large trucking companies that you see slandered online all the time are the best of the best at this business and they have been silently enduring the never ending nonsense that spews out of the mouths of the wannabes who couldn't cut it when they tried to pursue this career. All the trash talk you hear about trucking and trucking companies is total garbage. The folks who produce all this drivel about trucking are the very folks who didn't make the cut, and brother there are hordes of them! I 150% agree with oldshool! I’m not a driver but I have been in the industry for 11 years and have seen hundreds and hundreds of drivers come and go. Heard a lot of trash talk that did not add up to what I heard from veteran drivers. I would be very careful from where you get your opinions from, because people that failed at this industry will be the first to cloud your judgement. I would be worried about vetting where you get your info than vetting theses companies. Your definitely on the right website to get great info as long as you talk to the right people particularly people like old school that have been in trucking for a long time. So how are you liking trucking life now? What kinda mileage you averaging? I still love it as much as ever, as does the wife. It's still everything we expected it to be. However, I'm thinking of a change to local or regional, come spring or early summer. If not next year, then certainly in 2020. That's right... you heard it here first haha. I love the OTR lifestyle without a doubt. But I find it harder and harder to leave my granddaughter after hometime. Add to that a new grandson due in Nov., and this Papa is wanting to be a little closer to home. Like Old School said above, children have to play a major factor in your decision. Obviously I'll work with Prime to see if they can offer something to fill my needs. But that's a subject for another thread. I digress. Mileage wise I think I'm crushing it for a flatbedder. I haven't crunched the numbers, but I gotta be averaging at least 3k a week lately. Running that many miles in addition to securement and tarping makes for a busy week. I definitely understand you not wanting to miss out on your grandchildren. I have a 9 year old which is the reason I left the army. Think I can manage a few weeks away, but in the military it’s 12 sometimes 16 months, now that was hard. Anyways I plan on changing after I get a year in to something with more home time just feel like I need to put my time in and feel that I earned my way into trucking. You are definitely getting the miles and doing great! Are you getting anytime to stop and see any sites? If I decide to go with prime maybe we could meet up someday.